Well, it's New Year's Eve, and that means you've got two things on the brain right now: dieting and booze. 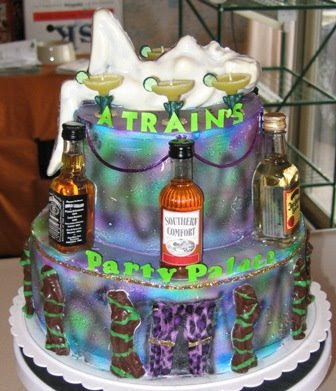 Since it's somewhat difficult to find cakes celebrating diets (which is really a shame; I'm holding out for the "all cakey carbs" diet) let me see what kind of alcohol-themed stuff I can dig up for you. Ok, here's a dreaded CCC (cupcake cake) for the martini lover: definitely shaken, not stirred. Uh, this looks more like a bottle of hair tonic than alcohol. (Not that I've ever *seen* a bottle of hair tonic, of course; I just imagine it would look like this.) Sorry, I'll keep looking. Very, uh, "creative". Can you picture the conversation that led to this cake order? 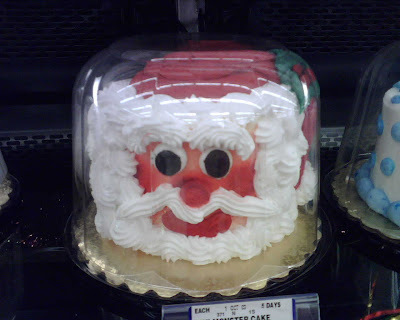 "We need a cake for Bob." "Ok, what does he like?" 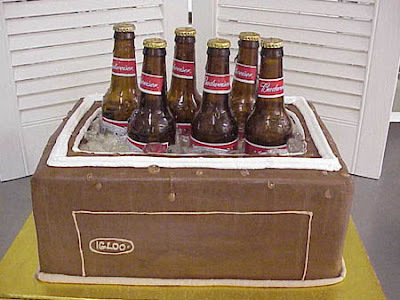 I have a friend who used to drink orange juice with his chocolate cake, but I'm pretty sure even he would agree that drinking beer with cake is just wrong. Blech. [shaking head sadly] Granted, it was considerate of the wreckerator to provide little bottles of "blur vision"for those unfortunate souls who will have to EAT the cake, but that hardly excuses the drunken airbrush weaving, the gold and purple shoelaces, or the [closing eyes] margarita candles. Not to mention the mystery foam, construction-paper lettering, or bizarre green-striped chocolate "ladies". Yikes. 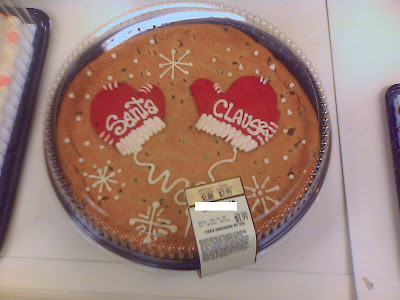 So remember: this New Year don't get mad, get C.L.A.D.D. 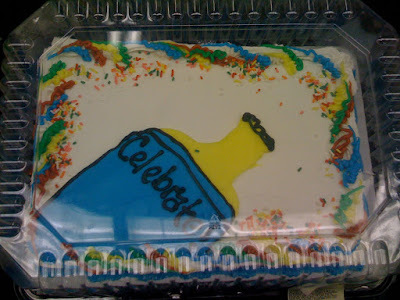 (Cake Lovers Against Drunk Decorating). 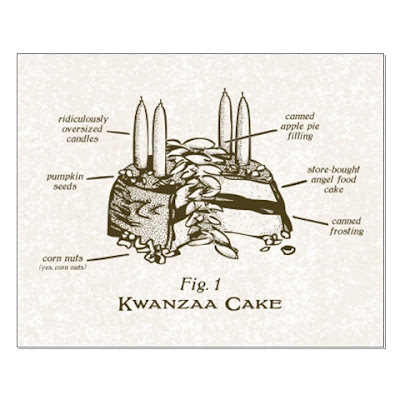 By the by, I verified that this was indeed listed on a "professional" bakery's website. A website which, oddly enough, is no longer operational. Go fig. Hey Jason T., Lynn B., Corianna L.,Kati B., and Marnie P.: if you didn't come to party, don't bother knockin' on my door. "Sweetie, I get the feeling your father has been a little impatient for us to have a boy." "Why do you say that, hon?" "Oh, you know, all the baseball equipment for the girls' birthdays..."
"Once we painted the tiaras on they wore them all day." "And you know earlier, when we told him we were having a boy this time? I'm sure that back flip couldn't have been good for his arthritis." "Oh, he was just being cute, is all. I'm sure the thought of us having a boy is no more exciting for him than the thought of our having another girl." "Riiight. 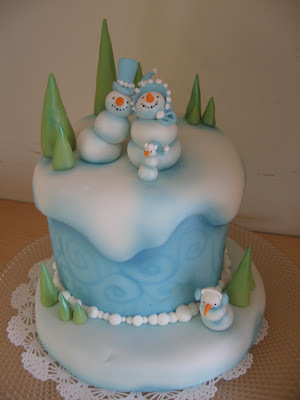 Have you seen the cake?" "Er. Does he think we're naming the baby Finaly?" "That's supposed to say "finally", dear." "So, do you want to tell him we were joking, or shall I?" Amy W., I'd wait 'til after the cake was served. Ok, my trusted Wreckporters, your assignment this week is: Fantasy. I'm talking trolls, fairies, dragons, kraken, anthropomorphized plant life, and yes, even unicorns (I'm drawing the line at tutus, though). As with all Sunday Sweets, these cakes do NOT have to be professionally made. 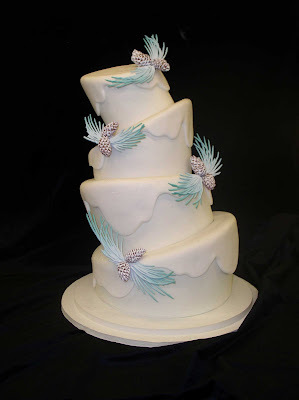 You can search bakery websites, public image hosting sites like Flickr, or use Google image search. 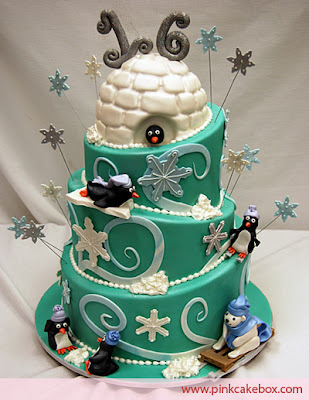 You can also submit your own cakes. Send them to me at Sunday Sweets [at] Cake Wrecks [dot] com, and be sure to include the image source so I can credit the baker. Have a suggestion for a Sunday Sweet Assignment? Leave me a note in the comments! NOTE: Please don't leave image links in the comments, guys: e-mail them to me instead. Thanks! 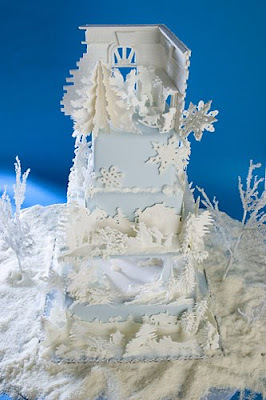 Here are some more amazing cakes you readers have submitted for the "Winter Wonderland" assignment. Although those snowflakes are lovely and delicate, my favorite bits are the marshmallows and "steam" rising from the cup of cocoa. Why can't every workplace have someone like you, Emily? I don't think I've ever seen shading done so skillfully. Love it. 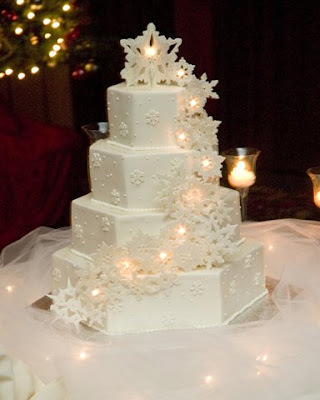 You wouldn't think a string of lights on a cake would look elegant, but Dianne Rockwell (aka "The Cake Lady") really managed it for this wedding cake. 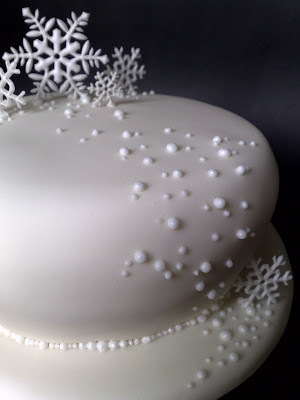 Don't those snowflakes look like porcelain? Super cute. Thanks to Heather, who I think was the very first to send it in. I almost feel chilly just looking at this; those snow-dusted pine needles are simply perfect. 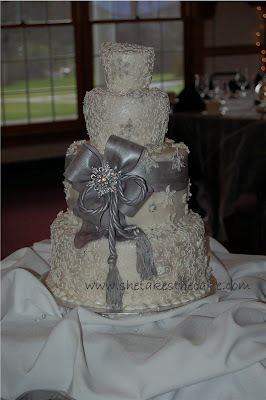 Click on the photo to see the larger version: the lace work and ribbon are truly incredible. Thanks again to all of you who submitted nominees for the Winter Wonderland assignment; I'm just sorry I couldn't include them all! Stay tuned for your next theme assignment! 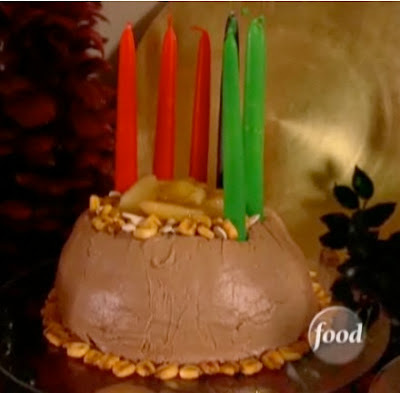 I made an exception before to include a Sandra Lee creation here on Wrecks, and I'm afraid I have to do so again. How could I not share this bit of holiday cheer with you all? If you want to watch Sandra work her magic you'll find the official video (with commercials) here, or watch a low-quality Youtube version here. 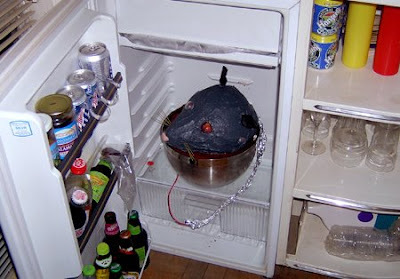 The title of this photo is "We have to eat it? ", and the reaction shot after she tries it is pretty priceless. I'm guessing it tastes as bad as it looks, Kitty? Today's Wrecks speak for themselves. Or at least attempt to. 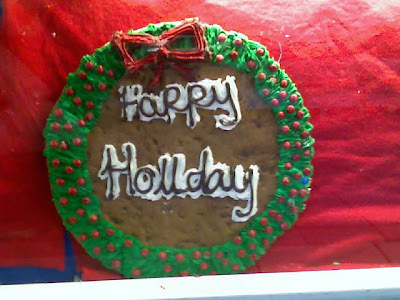 I find myself wishing this said "holladay", just so I could work in a lame Gwen Stefani reference. But since I'm just a girl (in the world), I guess I'll leave that up to you guys. Now that's a stingy well-wisher. 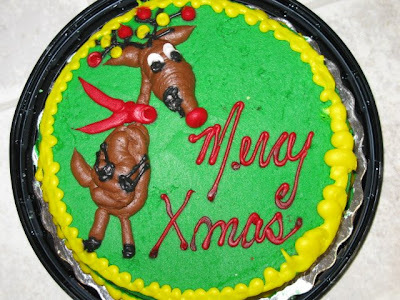 What's worse: making this cake, or serving it to all your employees at the company Christmas party? Ignorance can be beautiful. 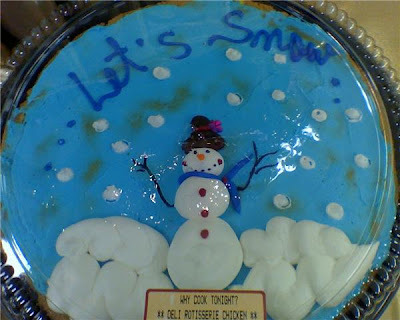 Unless of course this snowman is named "Happe", and belongs to someone named "Holidey". "Mercy" is right; get a load of what Rudolf is holding! 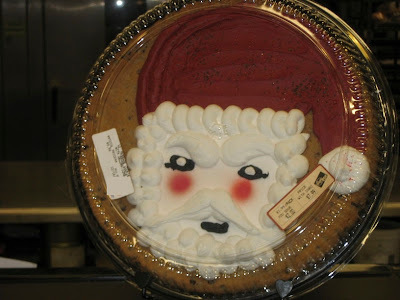 [singing] "I'll have a POO Christmas, without youuuu..."
Careful; buying this cookie "cake" may enter you into a binding legal contract. In case these failed to get the message across: Merry Christmas, all. May your day be sweet and utterly wreck-less . Many thanks to holiday Wreckporters Jenn S., Irene D., Bergen W., Todd T., Abby, Jennifer L., Jessica C., and Angela M.! We've already seen some flagrant Santa-abuse this year, but here's a Christmas count-down of some more ways the big guy gets no respect. Huh - I've never seen a handlebar mustache grow all the way around the nose like that, Shelby B. You think it's a French thing? 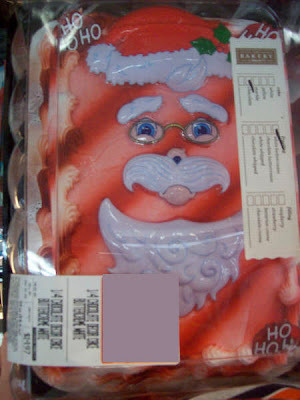 Poor Santa. You'll thank him later, dear wreckerator; he's only saving you from yourself in the long run. But once you see this stain you may believe." "No respect! I get no respect around here! That's a lump of coal for you, Jen! And why the *%&! do I never get a proper nose, anyway? Is it so hard to give me a frickin' little nose?!? Huh? I just - I'm so - I can't even talk to you anymore! Geez. Somebody get me a hot cocoa." I'd fetch that right away, Alden M.
But now it will haunt us both day and night. 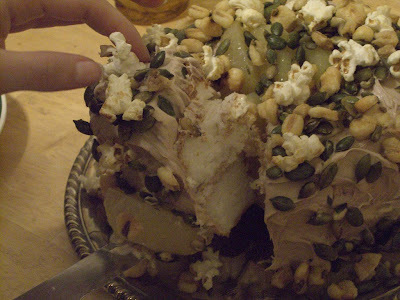 This cake makes a mockery of my horror, Chris L. It's also really icky. Tell me, do all University of Texas cakes look like week-old medical specimens? Check, check, check, and check check. Looks like we're covered, Heather K.! 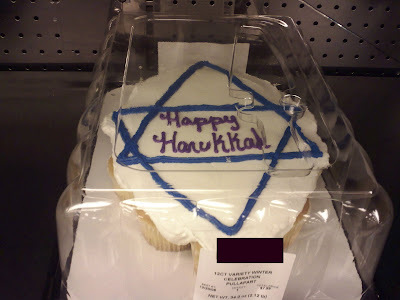 In yet another blow to true cake artists everywhere, many large chain bakeries are now "decorating" cakes almost exclusively with plastic flotsam. In theory, this means the "decorators" require even less skill, and therefore will wreck less cakes. That's the theory, anyway. Well, Kelinda S., I guess we can't complain too much here: so long as the decorators don't put the feet on backwards, there's really not much they could do to wreck this design up. Wait, did I say put the feet on backwards? (Yes, of course Santa bleeds sprinkles. Duh.) However, that head is actually plastic. It's even kind of cute, compared with the nightmarish clown-head-picks all us Wilton vets know so well. 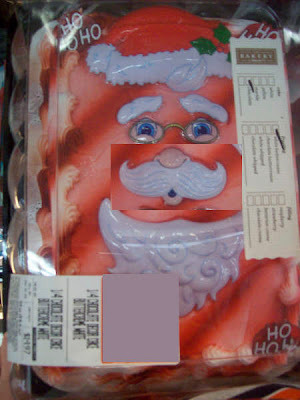 Attention Bakery Managers: you may want to post some instruction photos for these cheat kits. You know, to avoid the whole upside-down-nose-and-mustache thing. 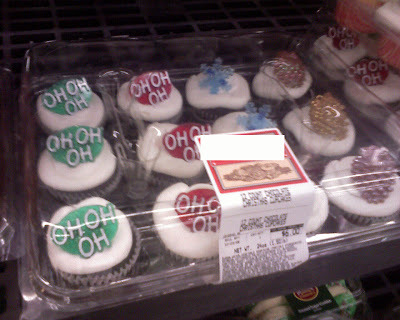 Even better: the package next to this one also has the "oh oh oh"s. Score!!! Wow - when I asked you guys to help me find the best Winter Sweets out there, I clearly underestimated how seriously you take your CW duties. Excellent work, evil henchmen/women/children! Due to the overload of submissions, I had to be pretty selective in choosing which ones to feature. 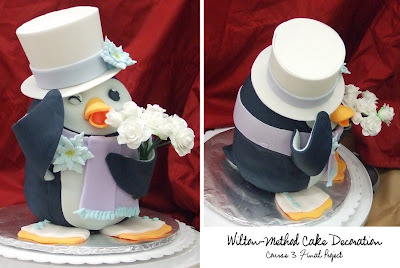 A lot of you sent in some really adorable cupcakes, but I stuck with cakes to whittle down the choices. I also looked for ones that fit the theme best - and, of course, I only picked my personal favorites. (But that goes without saying, right?) 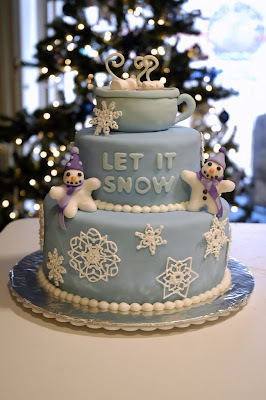 So, without further ado, here are the best Winter Wonderland cakes the 'net (and you readers) has to offer. Enjoy! She's sitting on rock candy! 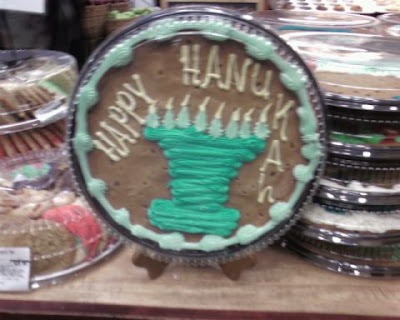 The baker's name is Yud, of Yud Creative Pastry (fyi: the site is written in Hebrew). I used to do paper-cuttings as a hobby, and this reminds me of all that intricate design work. 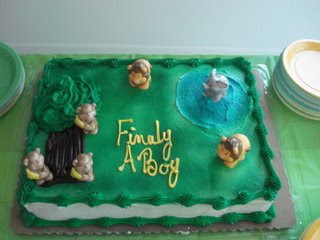 As you can see from the text, this was the baker's final project for her Wilton class. 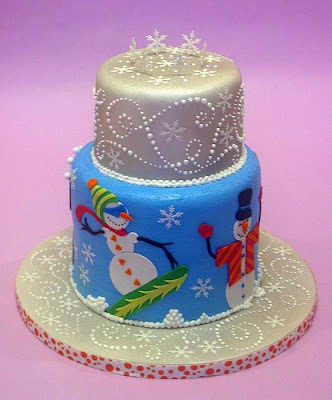 Now, I've taken all the Wilton classes, folks, and I can tell you they do NOT teach you this level of skill! So, Themie from Deviant Art, I tip my hat to you. Simply exquisite. It's by Nicky of Small Things Iced, where she also has some drop-dead-gorgeous cupcakes. Since I still have lots more Winter lovelies to share, I'll be continuing the Winter Wonderland theme through next Sunday. 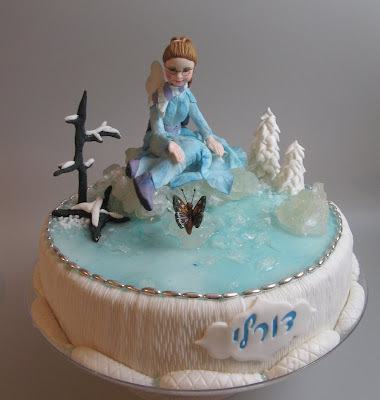 Check back then for more iced goodness, and stay tuned for your next Sweets assignment! Jami H. assures me there's actually cake under that mess. A mess, I might add, which is completely inedible - except for the frosting dots on the plastic aquarium sprigs, of course. So let's see: we've got trees, icicle garland, holly berries and leaves, and a shiny gold...ax? Srsly - who plans this stuff?